The palm tress in the back drop of the dessert has always made Palm Springs feel very magical to me. Since we stay away from traveling in very hot conditions, December was a good time for us to plan a trip there. This was our second trip to Southern California and we were looking for a unique experience. Making a side trip from LA which was our first stop was a nice a way for us to get a flavor of the area which has been made famous as a resort paradise. 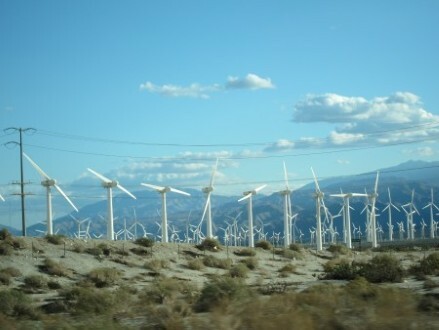 The drive from LA to Palm Springs was about 2hrs and varies with traffic depending on the time of day. It also accommodated the time our then active 9 month old could be confined to a car seat. The change in scenery from beach to dessert as we drove inward was fascinating. The wind mills against the blue sky were a beautiful sight. 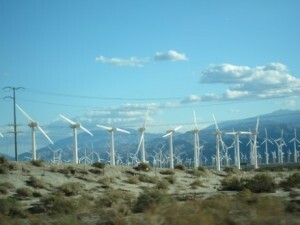 If the resort Palm Springs accommodations are above your budget, it is worth exploring at near by towns. We spent two nights at Dessert Hot Springs, a town adjacent to Palm Springs, which had a range affordable hotel options. Though we had a long list of must sees, we were forced to be realistic as we were traveling with a baby who had mastered crawling.He was frustrated at not having his usual floor space so it was hard to attempt too many activities that required keeping him in one place. The weather was also a little colder than we expected so we wanted to limit our time outside as well. 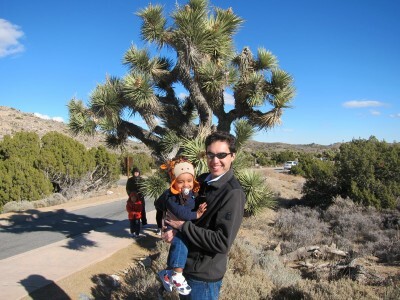 Driving through Joshua Tree National Park for a few hours was a great way to spend our morning until the weather got warm enough for us to be outside. This park has been on our must see list as we had been enthralled by the images we had seen online. The drive through the park with stops interspersed was a relaxing way to explore with the baby. Though the park is about an hour away, and the drive there itself is scenic tour of the area that we highly recommend to anyone visiting Palm Springs. After grabbing a quick lunch on the way, we arrived in downtown Palm Springs in the late afternoon. After a few minutes of looking around for street parking, we started walking down Palm Canyon Drive. The street was full of coffee shops, restaurants and eclectic stores. 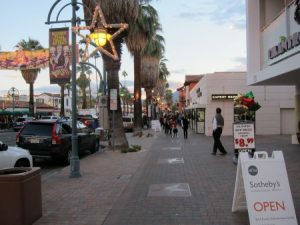 The Palm Springs Walk of Stars was symbolic of the area’s strong ties to entertainment industry. The giant Forever Marilyn statue was standing in the heart of downtown was hard to miss and provided a great photo op. At that time, we thought of this to be a Palm Springs tribute to her as the actress maintained close ties to this town. A visit to her 50s style bungalow home is well known tourist attraction in the area. Upon doing some research we learned that Forever Marilyn was placed in Palm Springs to commemorate her 50th death anniversary and that she would be moving in the following summer. Walking through this downtown, we got a glimpse of its rich history as well as its glitz and glamor. It was an easy area to navigate with a baby. We look forward to coming back again to attempt more of the activities like the touring Aerial Tramway and the Coachella Valley Preserve.